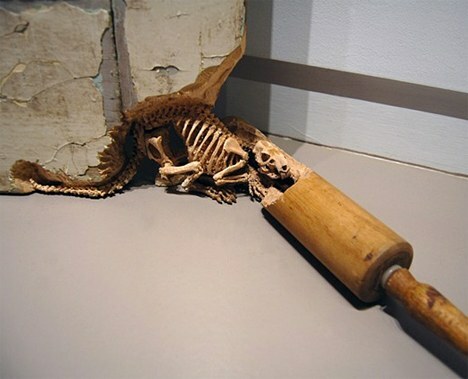 This via weburbanist, in turn via Maskull Lasserre. Check out the whole article and more pictures at weburbanist. MJG says- I love this, especially the artist’s coat hangars with the wooden skin stripped back and the underlying bones showing. Yes. Show me the true reality of things, Lasserre, the darkness under the norm. These images make me think of other instances of this kind of reveal. First to mind is the music video Sober by Tool. It’s from 1994, and features really disturbing clay animation of meat running in pipes. Fantastic. Turn on the faucet and out comes mince. Also grotesque, also what lies beneath, and also a great nightmarish video. There must be countless other examples of art at this level. Many books too, including much of the work of Neil Gaiman (Neverwhere, American Gods, The Graveyard Book). Anything springs to mind?